It’s Sunday and it’s noon and my children are still in their pajamas walking around with inflatable swords in their hands singing the Veggie Tales version of ROCK LOBSTER. Now if that image doesn’t put a smile on your face not sure what will. Today, however, is not your average Sunday. Today is my husband’s birthday. Yup the King of the House actually gets to be King for a day. Perhaps the villagers didn’t get that message though for they have been anything but subservient. 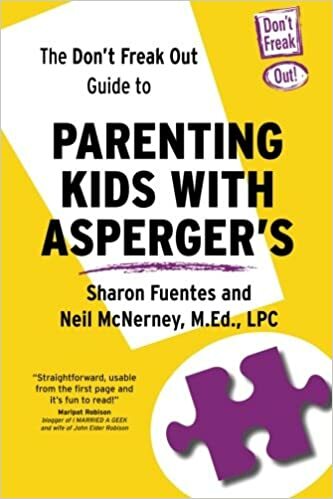 We had a true Asperger’s moment this morning and even though I knew that was what it was, well it didn’t make it any easier. Below will give those who don’t know what it can be like to live with an ASPIE a better idea. I know my son is wired differently. Change is hard for him. He doesn’t mean to be disrespectful or rude. Empathy doesn’t come naturally for Aspies. They tend to be very self-centered. This is why to outsiders who don’t know them or about them, they may come across as selfish and spoiled. Getting out of their heads and actually connecting with people is very hard for them. But when they do connect, it comes from a very organic place. It is pure and sincere and sweet. Fortunately, Jay does connect with us and others often. But this morning… not one of those times. Today we had a full-blown meltdown. Jay’s meltdowns can resemble a stereo typical Terrible Two outburst. His face reddens and the water works turn on. There was no throwing of oneself on the floor kicking and screaming (although that has happened before)… today we had self deprivation. Believe me…. I would rather have the kicking and screaming. “I’m a bad boy. No one loves me. No one understands me!” That last comment is true. I don’t understand him. I think that is the part that hurts the most being his mom. I can empathize with him, but I will never ever be able to totally understand him. And he is smart enough to know not only know this, but to use this in his favor. Long story short, we were able to calm him, and get him to partake in Dad’s birthday festivities. But of course as soon as the presents were open and the cupcakes were eaten, he was off to play his video game. And I let him too. I let him because I know if he doesn’t finish that level, well his whole day will be messed up. Maybe I do understand my son a little bit after all! I have been there. In that moument when you know that the meltdown is going to happen and you just can not stop it. And it is always over something small. My son is not an Aspie kid, he is a sensory kid. In many ways he looks like Jay, and he meltsdown like Jay! When the sensory system hits over load……and this can happen for no outwardly apparent reason, it is all reaction and no thought. And here as mom we sit wondering how do we help them to not have to go there again. The good news is, they mature, they learn to handle things in ways we never would because they are wired differently. Some of us are in a box, some of us can easily think outside the box, and then there are OUR kids….who ask what box?? or why do we need a box? Thank you so much for your post and kind words and for understanding! And you are right… I feel blessed for both my children but I am definitely learning A LOT from Jay! I can definitely relate to this. I am Becca’s friend and I have a 10-year-old son with Asperger’s syndome. He is so excited when it’s his birthday, of course, but when it’s someone else’s birthday we coax him to join in on the obligatory birthday festivities and then he usually returns to playing video games, reading, or building Legos. I try not to push him as hard as I used to on these matters. As you mention, when an Aspie does something for someone it is on his or her terms and it is very genuine and special. Last month for my birthday my son refused to go shopping with my husband and daughter to pick out a gift for me (too busy playing and a meltdown was coming if my husband forced him to go). But later my son gave me a handmade card and a big hug, which was more meaningful to me than a forced store-bought gift. But I do wish I had a quarter, or a penny, for every time I have heard “I can’t pause until I finish this level.”! Hello Kristin and welcome to my BLOG. It is a pleasure to meet another Aspie mom and one who is the same age as mine! I hope to hear from you often as I know you can relate to me and I am sure I can relate to you. If you ever need to talk… well just shoot me an email. Becca has my number too. I got a tear in my eye about what you wrote about your birthday last month. I so understand!